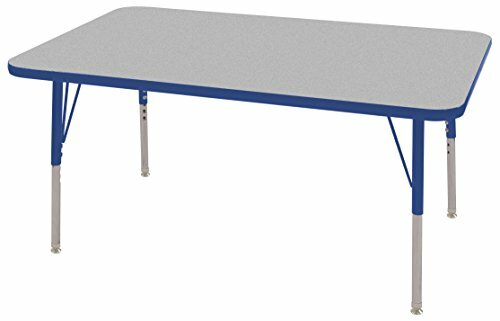 Ideal for use in classrooms, playrooms, churches, recreational centers, and at home, the ECR4Kids adjustable activity table and chair package provides a versatile and fun space for kids to work or play. The package includes the appropriate number of school stack chairs featuring complementary color and glide. The double-sided laminate tabletop is easy to clean and sanitize between science experiments and snack time, and it features rounded edges for safety. Chunky table legs adjust in 1-inch increments from 15 to 24 inches to accommodate growing children. Upper table legs are powder coated tubular steel and lower legs are chrome plated. This set's chairs feature a molded seat with vented back for comfort, reinforced ribbing in back and under the seat for added strength, a steel lower back support, and chrome legs. Chair legs have ball glides that are made for durability and protection on carpeted floors. ECR4Kids adjustable activity tables have achieved GREENGUARD [GOLD] Certification for low chemical emissions into indoor air during product usage. They are also CPSIA-compliant for safety. With a concentration on the Pre K-12 sector, ECR4Kids offers a wide range of products from tables, chairs and desks to cots, mats and a variety of storage cases in solid wood as well as scratch resistant double-sided laminate.